There are several high-end steakhouses in Western New York. Only one uses its owner as decor. ¶ But that’s always been Russell Salvatore’s way. He developed Salvatore’s Italian Gardens, one of Western New York’s signature restaurants, then started Russell’s Steaks, Chops & More, a worthy competitor, a mile away. Even if he’s off duty, his beaming image greets you in the foyer, and says goodbye on the paper coaster underneath your dessert cup. ¶ The bonhomie is genuine in the opulent dining room, and the staff is polished at providing a memorable evening. The steaks are first class. It’s still fine dining, but a few disappointments elsewhere in our meal brought the experience down. That’s what I would have told Salvatore, if he asked. The great big American flag outside welcomes you to the domain of a showman. It does look luxurious, a separate bar with big screens leading to dining rooms lined with intimate booths, and broad tables paired with relaxing chairs. Walls and ceilings are lit with a red velvet glow. The menu stays the steakhouse course, with an appetizer list dominated by raw and cooked seafood, including fresh oysters, clams and shrimp. Steaks and chops are the main event, with lobster, crab and tuna. Diners order vegetables and potatoes separately, standard steakhouse protocol. For appetizers, we ordered crab cakes ($15), tomato and mozzarella salad ($10), poached pear salad ($10) and artichokes francaise ($9). 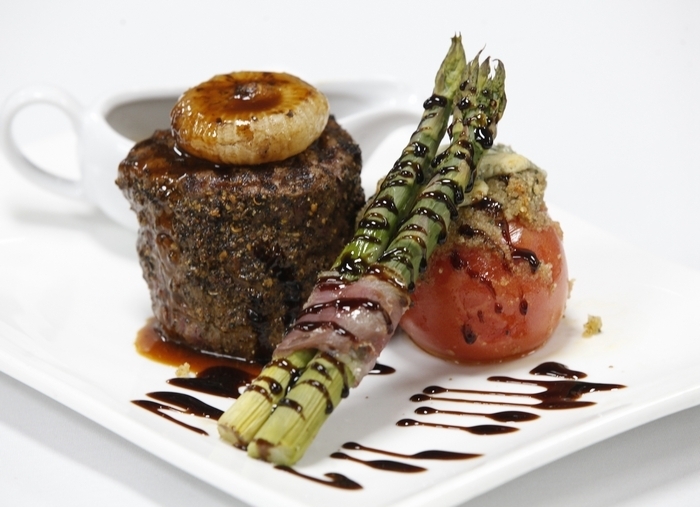 Guests asked for filet mignon with artichoke topping ($43), filet topped with a sun-dried tomato goat cheese ($43), and a special 14-ounce filet with baked tomato and prosciutto-wrapped asparagus ($49). I ordered poached salmon with champagne dill sauce, to try the seafood side. We ordered large sides of creamed spinach ($7) and potato gratin ($9). The Russell’s bread basket appeared, loaded with thin crisp slices of raisin cinnamon toast, fortified with pecans. The effect was more cookie than bread, but I don’t mind having dessert first. The basket was eventually removed from my reach. There also was a matzolike cracker and an array of briny tapenade, strawberry butter and plain butter, which weren’t that exciting. The artichokes came out in a Milanese-style crumb breading, dusted with plenty of grated cheese and swimming in herbed butter. They weren’t light in the least, but plenty tasty. The tomato and fresh mozzarella salad interspersed tomato with cheese slices, adorned with chopped red onion, basil, blue cheese crumbles and balsamic dressing. The tomatoes were average, and so was the salad. Though the menu said shaved onion, it appeared in chunks. The poached Bosc half pear at the heart of the pear salad was mushy, its flavor overpowered by the big scoop of blue cheese mousse. The salad greens were fresh, but too vinegary for me, and topped with more blue cheese. Crab cakes were two small rounds on a pretty plate centered around colorful julienned vegetables, with chipotle and mustard sauces. Unlike most, these made good on their promise of sweet lump crabmeat, with scarcely any binder. The spicy-smoky chipotle sauce tickled my palate but left other tongues afire. The steaks were terrific, quality beef cooked accurately, for the most part. No surprise there. The crusted versions saw added interest and flavor from their artichoke and sun-dried tomato toppings. My favorite was the latter, whose crust included goat cheese, giving it a welcome huskiness. Accompaniments were uneven, though. A stuffed tomato with a $49 steak should be better than a tomato bearing a couple of tablespoons of seasoned breadcrumbs, left half-raw inside. My salmon was surprisingly moist, the dill cream sauce on the dull side. Green beans and carrots were fresh and tender. Large servings of side dishes were smaller than I expected, enough for two. Potato gratin was hearty and cheesy enough, though I didn’t catch how five kinds of cheese helped its flavor. The creamed spinach was delicious, loaded with fresh greenery, a note of nutmeg, enough cream to keep it together and a modest amount of cheese. Unfortunately the spinach wasn’t chopped, so inelegant strands dangled from my fork like seaweed from an anchor. Desserts included banana pudding, brownie sundae and peanut butter pie (all $7), and cannoli Foster ($8). The pudding was basic, with cookies, pudding and sliced bananas in a glass. The brownie sundae was decadent and fudgy. I liked the peanut butter pie best, with layers of peanut butter and chocolate mousses in a cookie crust. The cannoli Foster was enjoyable, especially the orange-accented sweetened mascarpone filling with bites of crisp cannoli shell. The bananas were not pan-caramelized as advertised, but fresh bananas in caramel sauce. It was still an interesting combination. Our waiter and his helpers gave us everything we wanted, with no service stutters, and Russell’s remains a special night on the town. I didn’t see the owner during our visit, but that’s not a criticism. Restaurants are a team game. One man can only do so much. Fine steaks and first-class service make Russell’s a special night out. HOURS: 5 to 11 p.m. Monday through Saturday and 5 to 10 p.m. Sunday. PRICE RANGE: Appetizers, $7-$21; entrees $27-$59.